Good afternoon, lovelies! As promised yesterday, today's post is all about the new knitwear patterns from Colette. 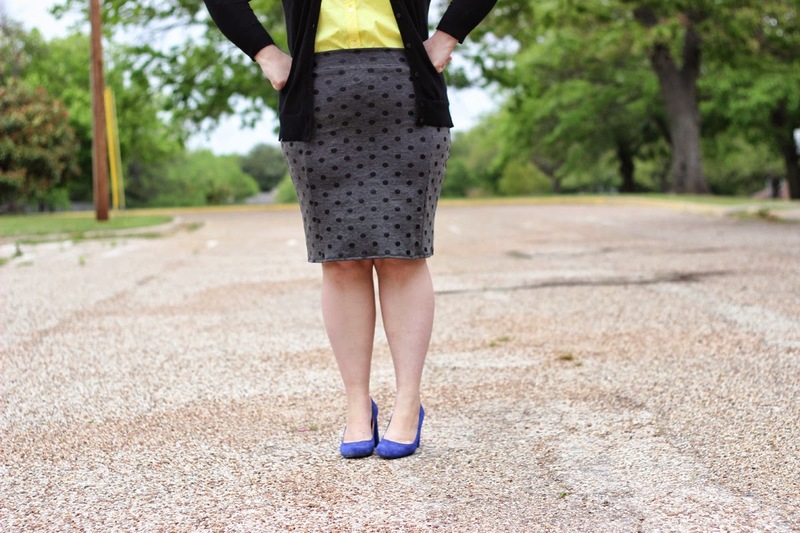 Since Jenny unveiled her fabulous Moneta yesterday, I thought it only fitting that I kick off the Curvy Colette Blog Tour with that most perfect of pencil skirts, the Mabel. When we first received the two patterns, earlier this month, I fell head-over-heels for Miss Mabel. 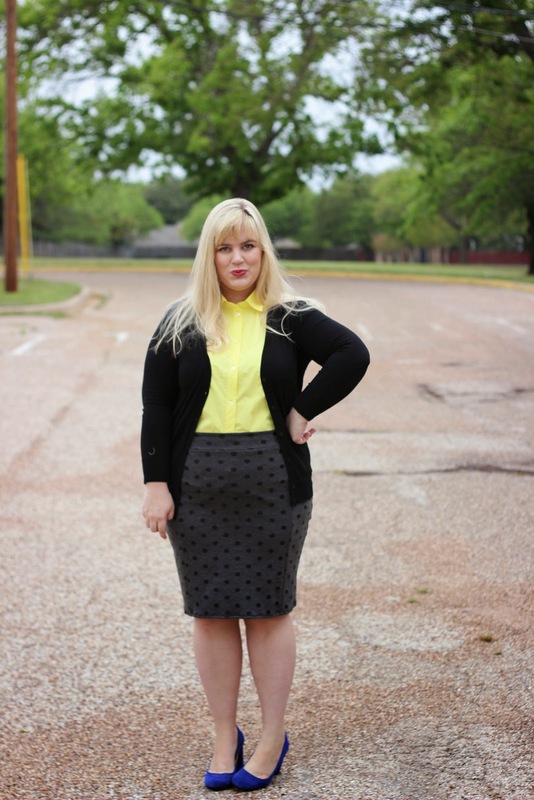 Why didn't I already own a knit pencil skirt? The concept is genius. All the elegance of a curve-hugging skirt, but with the comfort of yoga pants? Sign me up. Deceptively comfortable clothing is, as has been documented lately, one of my favorite things to make and wear! Let me tell you, darlings, the Mabel did not disappoint. She's gorgeous! For my first foray into knit skirt bliss, I chose a charcoal ponte de roma knit from Girl Charlee and the longer version of Miss Mabel. It's a midweight knit, as recommended by the pattern, with black foil polka dots marching over it. Up close, the dots have just a bit of sheen, like little leather appliques. Weird, but wonderful. The only trick for this skirt was choosing the proper size. With other Colette patterns I'm usually a blend of the 14 and the 16, translating to an XL in the new knits. Having never owned a knit skirt before, however, I was trepidatious. Would my proper size cling too much? Would every bump, every rolling hill of my backside be discerned by passers-by? The horror! I needn't have worried, of course. The XL worked perfectly for my body shape, flattering in all the right places and skimming over everything else. Y'all, my curves look bangin' in this skirt. If you're searching for the perfect work-to-play skirt pattern, look no further. Mabel rocks the category. With a cardigan and tailored button-down, like my new Archer it's paired with here, this skirt is all easy elegance. With a vintage t-shirt and leather jacket? Badass concert attire! Since I don't currently own a leather jacket, I stuck to the professional side of things for this post. Also, note to Mary: fix that gap in your closet now! Mabel deserves to be a cool kid. Let's talk construction though, shall we? Not only does Mabel come with really helpful instructions, but Sarai and Alyson have also released The Colette Guide to Sewing Knits, to hand-hold us through all of those first time knit anxieties. If you are a knits beginner, the Mabel is the perfect pattern to start with. The front of the skirt is pieced, for an extra flattering silhouette, while the back is a simple kick-pleat design. This is a pattern that could easily be sewn on a regular sewing machine, with nothing more than a zig-zag stitch and some courage. Easy, well-drafted, and quick! Kittens, this skirt took me an hour-and-a-half to make. That's from cutting to hem, y'all. Have you ever heard of anything so wonderful? This is, far and away, my quickest sewing project ever. Everything was really expertly designed, from the seam placement to the waistband lining method, and a breeze to put together. Most of my stitching was done on the serger, apart from the twin-needle hem, which also hurried things along. This was such a fun pattern to make! Once my sewing schedule calms down, expect to see quite a few more Mabels. When a skirt is this cute, a girl needs it in every color, don't you think? 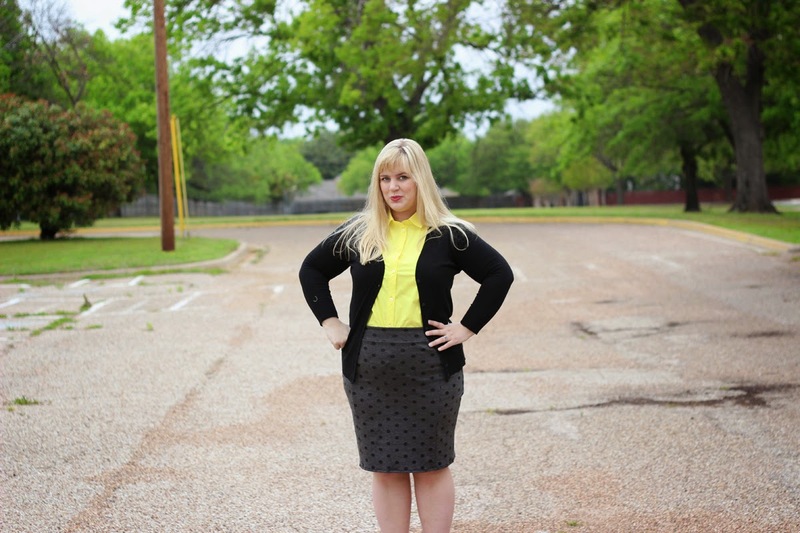 If you were at all nervous about how a knit skirt would translate onto a curvy body, rest easy. Grab a heavy knit and make yourself a Mabel! You won't regret it. The ease! 1.5 hours, cannot be emphasized enough. The seaming! So, so flattering for those who want to show off some curves. The comfort! Knits are the best. Finding a nice midweight knit is key here. If you want a skirt that will glide over hills, instead of cling to them, you need something more substantial than a jersey. Try a ponte, double-knit, or very stretchy pique. 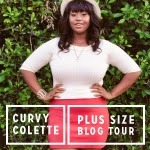 Don't forget to keep up with the Curvy Colette Blog Tour on all of our stops! Tomorrow, I'll be back for an interview with knitwear goddess herself, Alyson Clair, and next week I'll debut my own Moneta dress.